Thanks for all your sweet responses to my wild yard woes! I never would hire a lawn service, anyway, because it takes a whole lotta chemicals to keep a lawn that lush. My babies play outside almost every day! 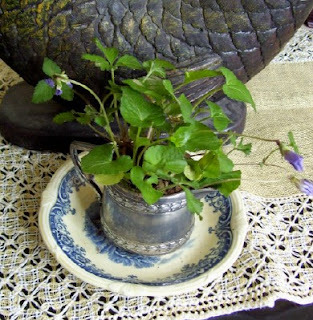 As to potting wild violets, there's nothing to it. I planned on using these clumps as temporary decoration, the rooted equivalent of cut flowers. I left the dirt clinging and stuck them in undraining containers, watering every couple of days. To my surprise, they're flourishing, two weeks later! Now that's a plant you have to love. Violets are wonderful - do you have wild white ones as well? Also, did you know that violet seeds are produced, not at the flower, but at a little green thingie down near the bottom of the stems - have to look close to find them. Learned that from a TV show for kids years ago. Kids immediately went out and declared the TV host was right!! You are SO right about the lawn services. At one point in time (many moons and another life ago) we had beautiful lawns courtesy of a lawn service. Lost both of our precious dogs to cancer, too. Praise God the children are all okay!